This week I'm sharing my recipe for a Monte Cristo Sandwich along with dozens of other bloggers part of the Sunday Supper Movement. I think it's a great idea to check out a curated collection of recipes to use up all of the leftover bits and pieces of Turkey Day before the day actually gets here. There's nothing more depressing than looking at a turkey carcass and not knowing what to do with it. This week's theme is Thanksgiving Leftovers and is being hosted by Jennie of Messy Baker Blog. Click it and check out her flour-dusted kitchen! When I was a kid, there was a diner not far from our house, Oak Lane Diner on North Broad Street, in Philadelphia. It's been open as long as I've been alive and every time I visit the city of my birth, I try to eat at least one meal there. In this place, it was the first time I had a Monte Cristo sandwich. As I munched down on the crispy edges and dipped it in the strawberry preserves on the side, my mom told me the nutshell version of The Count of Monte Cristo along with a biography of his creator, author Alexandre Dumas. The only thing the book and the sandwich have in common is it's a Francophile. It's an Americanized hybrid of a croque monsieur-madame thing. This recipe of mine is a version that takes leftover Thanksgiving ham and/or turkey, makes a spirited raspberry at the grilled cheese's mom and sleeps with its sister. It's dipped in a thick, creamy batter and pan-griddled in butter. And then there's powdered sugar dusted on top. Typically, a sugary-sweet berry sauce is served on the side or poured on top, but I put Thanksgiving's leftover cranberry sauce on the inside to make this the most decadent thing since deep fried Twinkies. I realize that after indulging and stuffing yourself with 1000s of calories over the Thanksgiving holiday, pan-frying a sandwich dipped in cream and egg may not set well with you, but guess what: Eat some quinoa and be sad or just tell your family to order the extra large casket while making arrangements because [insert annoying exclamation that begins with 'Y' here]! Spread 1 slice of bread with the Dijon mustard. Then layer on 1 slice of cheese followed by both slices of ham or turkey and the last piece of cheese. Spread the cranberry sauce on the other piece of bread, then press it, spread side down, on top of the cheese to create the sandwich. Place a skillet over medium-high heat. As the skillet heats, whisk the egg, flour and milk in a shallow bowl until blended. Put the butter in the center of the pan. As it starts to melt, hold the sandwich together firmly and briefly submerge one surface in the egg batter then twist and submerge the other surface. Immediately place the sandwich in the pan, before the butter browns. Grill the sandwich on the first side for about 3 to 5 minutes, until golden brown. Then flip it with a spatula and grill it on the second side for another 3 to 5 minutes. Using a spatula, transfer the sandwich from the pan to a plate or cutting board, slice it in half and dust with powdered sugar and serve. Don't forget to check out all of the other Sunday Supper contributors and pick out a few Thanksgiving leftover ideas for you and your family this year! Join the #SundaySupper conversation on Twitter on Sunday!We tweet throughout the day and share recipes from all over the world. Our weekly chat starts at 7 p.m. ET. 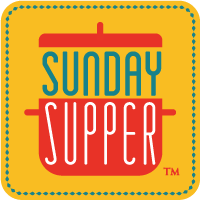 Follow the #SundaySupper hashtagand remember to include it in your tweets to join in the chat. To get more great Sunday Supper Recipes, visit our website or check out our Pinterest board. Would you like to join the Sunday Supper Movement? It’s easy. You can sign up by clicking here: Sunday Supper Movement. Nikki...wish you were here so I could hug you -- this looks FAB!!! We eat with abandon all of Thanksgiving weekend, so I can make this and not feel bad at all. Then, I can eat quinoa come the following Monday ;). I love everything about these sandwiches, they are some of my favorites! I die for Monte Cristos!! Only a girl who has frequent diners in the Northeast can do it right! And with Thanksgiving leftovers - even better. 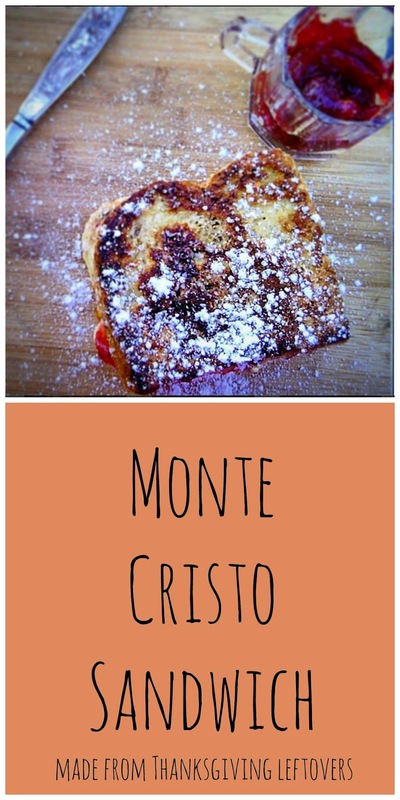 This looks wonderful, I have not had a monte cristo forever!! I've never had a Monte Cristo sandwich, and truthfully I never knew what it was until now! Wow...that is one truly indulgent sandwich! Thank you so much, Wendy! You're so sweet to me! Happy Thanksgiving! IThanks, Bri! I'm really looking forward to eating dinner so that I can make more of these! This deliciousness needs to make it's way to my life! YUM!! Now's your chance! Or maybe with other holiday leftovers? I'm glad my post enlightened you! Make 'em for the kids! They'll love them! So many amazing Sunday Supper dishes this week! This one might just be my favorite, I love a good monte cristo! A Monte Cristo is in my top 5 favorite sammies of all time. I want this now - no waiting for leftovers! This is one of my all time favorite sandwiches! Looking forward to making one this Friday with all those awesome left overs! "This recipe of mine is a version that takes leftover Thanksgiving ham and/or turkey, makes a spirited raspberry at the grilled cheese's mom and sleeps with its sister." LOVE IT! :-D Also, I'll have 2 of these sandwiches! What a great line up of delicious recipes! I love that you can use up left over ham or turkey in this sandwich! I just made monte cristo sandwiches last week - they are the best sandwiches ever! yours looks wonderful. We'd have to go to a fancy restaurant to get one of these when I was a child. These look great! There are so many amazing ideas here! The monte crisco is really fun, too. Nice twist on the traditional "leftovers sandwich"
It's been a long time since I've had a Monte Cristo. But man, they're good...especially with a smear of Dijon like you did here. Would you believe I've never had a monte cristo? I eat weird things, but I for some reason I can't get past the french toast, plus jam, plus deli meat combo. Yours looks good though, perhaps I'll give it a go. What a great idea for leftovers! Nothing is as good as a turkey sandwich! Now THAT is one sassy sandwich! I've never eaten a Monte Cristo--it's shameful, really. I need to change that pronto. WOW I have never had a Monte Cristo before. I had no idea what I was missing, it sounds fab!! My mom goes just nuts for monte cristo sandwiches. This is such an inspired share for post-Thanksgiving bits! Happy Holidays! My all time favorite sandwich!! Yours looks crazy good! 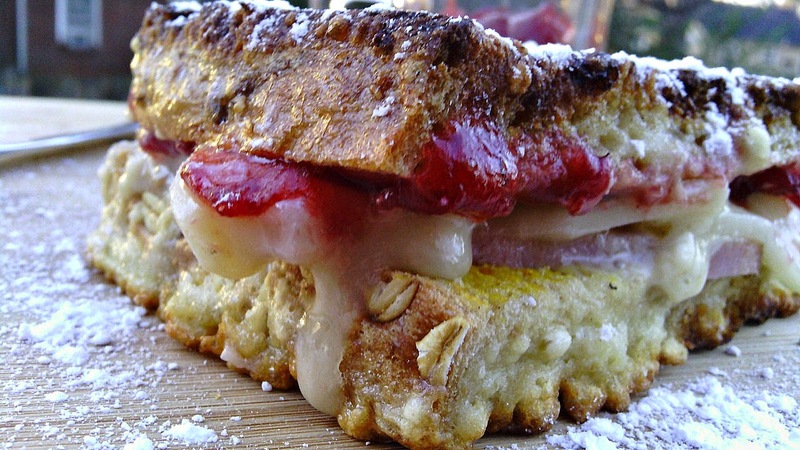 I LOVE a Monte Cristo sandwich and this Monte Cristo has me making plans to replicate this lovely on Friday - Yum! Nikki you're the first one to mention ham. We often had ham and turkey on Thanksgiving! Monte Cristo are a great leftovers idea! I have a coworker who ADORES this kind of treat, especially after our school's turkey lunches! My FAVORITE sandwich, ever!!! These look divine!